Since their first acquisition in 1990, Sydney art lovers and philanthropists James Agapitos OAM and Ray Wilson have been passionate collectors of Australian Surrealist paintings, photographs, prints and drawings. Their collection contains more than three hundred works spanning the period 1925 to 1955 and is unrivalled by any other public or private collection. 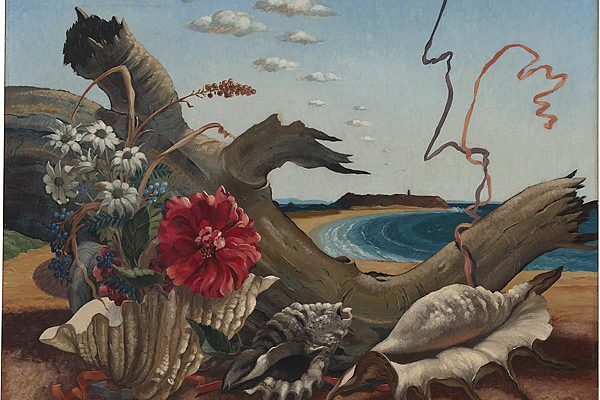 Australian Surrealism comprises some ninety paintings and works on paper by thirty-five artists from that Collection, displayed publicly together for the first time. It also provides a rare insight into the dedication and passion of two extraordinary men. Surrealism was one of the most dynamic and diverse art movements of the twentieth century. Inspired by the writings of André Breton and the paintings of Salvador Dali and René Magritte, Australian artists in the 1930s and early 1940s examined their own culture through a similar lens, producing distinctive results. Employing dream imagery, poetry, precarious and suggestive juxtapositions, artists responded to a political environment, which was drawing the nation toward war. “The complex composition [of Surrealist works], the symbolism and the vision of their creators stimulated us greatly,” says James Agapitos OAM, a businessman who migrated from Greece to Australia in 1952. He met his Melbourne-born partner, Ray Wilson in 1967 and together they began to collect works of art. When a major exhibition of Surrealism was organized by the National Gallery of Australia in 1993, their passion for the subject was truly ignited and they became aware that Surrealism was not simply a European tradition but also has a rich history in Australia. The exhibition features many of Australia’s best known artists of the period including: James Gleeson, James Cant, Russell Drysdale, Jeffrey Smart, Max Dupain, Adrian Feint, Ivor Francis, Donald Friend, Robert Klippel, Joy Hester, Dusan Marek, Sidney Nolan, Douglas Roberts, Peter Purves Smith, Eric Thake and Albert Tucker. “Australian Surrealist art has been largely ignored internationally and neglected in Australia…until now” says Ray Wilson. James Agapitos and Ray Wilson regard their Collection as an intrinsic part of Australia’s cultural patrimony. They hope that this exhibition, and the accompanying publication, will make it available to a wider national and international audience, and that their proposed gift of the entire collection to a public institution will return it to the ownership of all Australians.